While on my LA press trip last month, I not only visited the LA Zoo but also enjoyed a pre-screening of the documentary Disneynature Bears. Bears is narrated by John C. Reilly which I find funny because he’s most recognized for Step Brothers (Dale Doback), Wreck-It Ralph (voice of Ralph), Talladega Nights: The Ballad of Ricky Bobby (Cal Naughton Jr.) and Marvel’s upcoming Guardians of the Galaxy (Rhomann Day). Disneynature takes you on a true life adventure with a mother bear and her cubs on their year long journey. You watch as the mother bear teaches her young cubs, Amber and Scout, life’s most important lessons before they venture off into the world on their own. We are taken on the journey through the planet’s last great wilderness – Alaska where the bear family lives. The Alaskan scenery is absolutely breathtaking! We see the bear family emerge from hibernation as winter comes to an end. The mother bear is forced with life threatening obstacles as she takes her cubs through the treacherous mountains. Of course, one of the biggest threats are avalanches as the winter snow begins to melt. We watch as the seasons change from winter to spring to summer and how the bears must work hard to find food. They eventually find the plentiful salmon run. It’s so funny watching as the bears try to catch the salmon. The bears face many predators during their journey including a pack of wolves and even rival male bears. It is amazing how enormous the male bears are and how they fight to find food. The mother bear and her cubs are often put into danger by these male bears. Disneynature Bears is an absolute must see for the whole family! Your kids will fall in love with bear cubs, Amber and Scout! I got one of the plush cubs while on my trip and my son sleeps with it every night… of course, Crocky is right there too! Disneynature Bears is directed by Alastair Fothergill (Earth, African Cats and Chimpanzee) and Keith Scholey (African Cats). See Disneynature Bears opening week and Disneynature will make a donation to the National Park Foundation through the Disney Worldwide Conservation fund to protect wildlife and wild places. The Disney Store will contribute $1 to the National Park Foundation for every Bears plush purchased between now and 5/11/14. Get your Amber bear plush or Scout bear plush. DODOcase was also kind enough to give all of the bloggers a limited edition Bears case to take home. I received an iPad case which is so awesome! DODOcase has just introduced a limited edition collection of iPad Air, iPad Mini and iPhone 5/5S cases featuring a custom BEARSdesign. They are also offering 20% of each sale that will go directly to the National Park Foundation! Visit http://www.dodocase.com/search?q=bears to purchase and learn more. 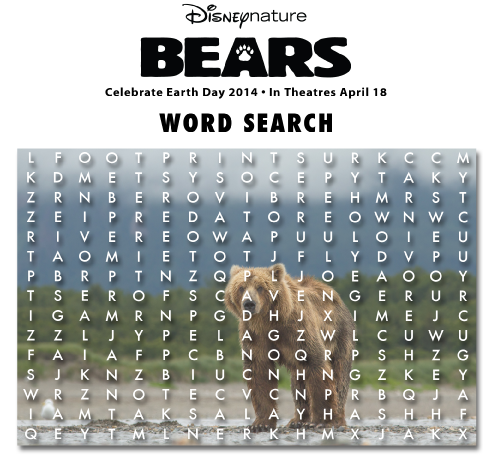 Don’t forget your Disneynature Bears Printable Activity Sheets for Kids! Be sure to follow along with us at #DisneynatureBears and #MeetTheCubs! Disneynature Bears arrives in theaters everywhere today April 18, 2014, to celebrate Earth Day! it’s such an adventure that they let us take this journey with them with this movie, Amber and Scout are great names for these cubs. I love that they have activity sheets to go along- great for kids! What a nice way to learn about bears and their way of living in nature. The Alaskan landscape seen in the footage is breath-taking! I’m glad Disney will donate money from the first week and the plush bear purchases to their conservation fund! This looks like it will be such an amazing movie! This movie looks like it will be really good. The baby bear cubs are so cute. It’s amazing what kind of camera work these people can get when filming nature movies.